The Maryland Department of the Environment (MDE) held a hearing on a proposed regulation to reduce the BRESCO trash-burning incinerator’s nitrogen oxide (NOx) pollution. 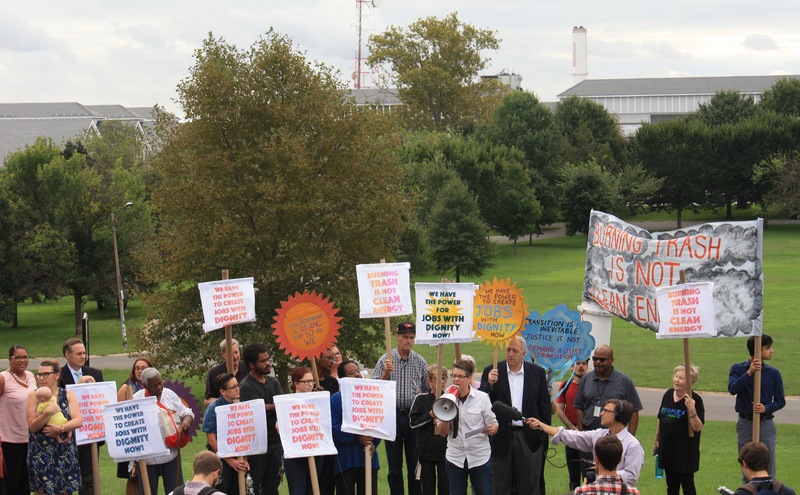 Residents rallied in Carroll Park before the hearing to demand clean air and a just transition to zero waste. 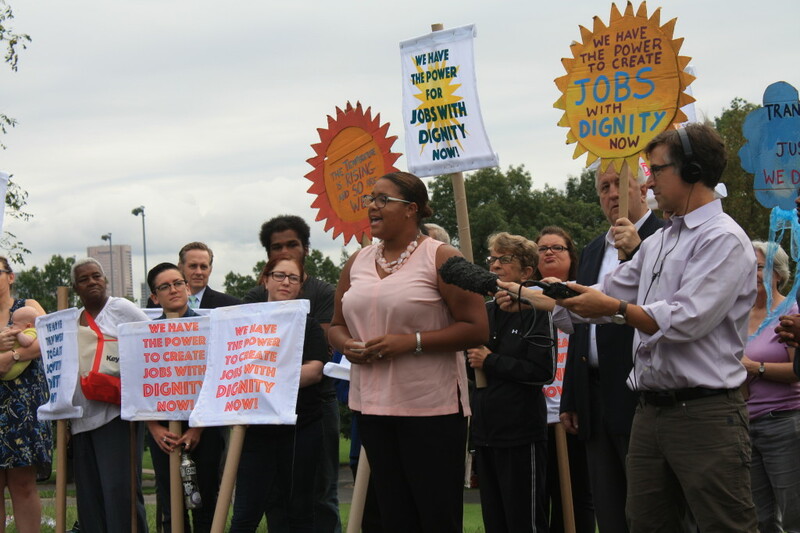 BALTIMORE, MD — On September 21st, a group of Baltimore residents, local elected officials, and environmental advocates rallied in a strong showing of support for clean air and a just transition to zero waste in Baltimore before a hearing at the Maryland Department of the Environment (MDE). 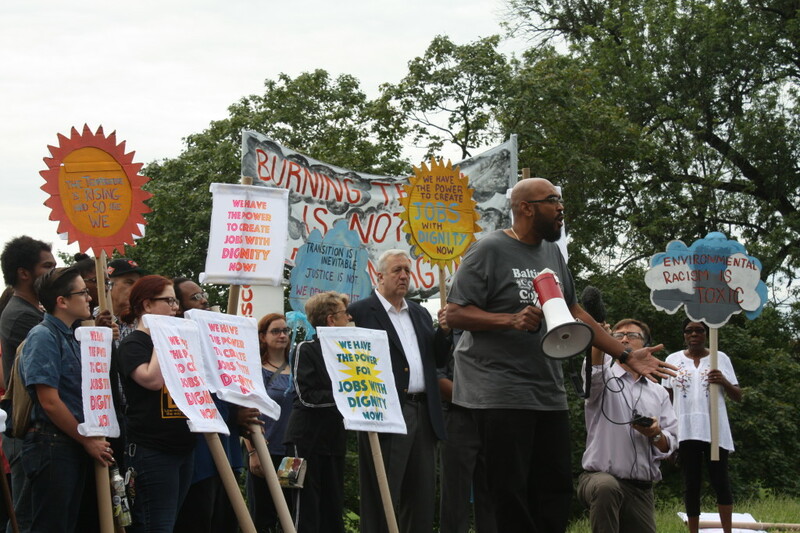 During the rally in Carroll Park, community leaders living near the incinerator joined by city councilmembers and technical experts shared new information about BRESCO’s emissions and efforts underway to lead Baltimore to a just transition away from incineration towards zero waste. Marvin Hayes with the Baltimore Compost Collective spoke about the need to compost, rather than burn, our food waste. Residents marched from the rally in Carroll Park to the Maryland Department of the Environment for the hearing on BRESCO’s NOx pollution. As a part of the proposed regulation, MDE has also charted a path toward setting even stricter emissions limits in 2020. 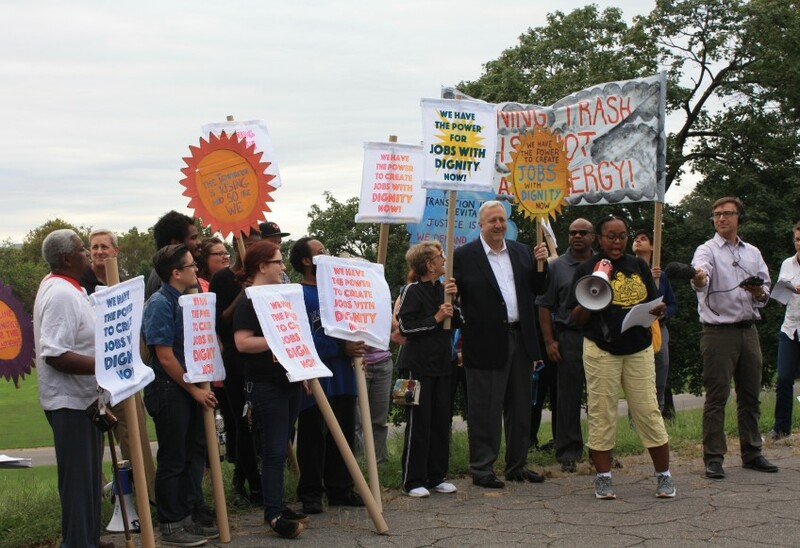 Councilman Edward Reisinger of Baltimore’s 10th district, home of the incinerator, said, “BRESCO needs to update their facility or close!” Advocates told MDE that it must go much farther to protect public health during this process, particularly given the amount of money the facility receives from the state. According to the Baltimore Sun, Wheelabrator has been awarded approximately $10 million over the past six years for being a so-called “renewable” source of energy in Maryland. However, the pollution limits in MDE’s rule require the company to spend a mere fraction of this – $225,000 to $250,000 a year – to clean up the NOx emitted from the incinerator’s smokestack. And ultimately, even with the possibility of stronger pollution limits in the future, burning trash will remain an inherently polluting and unsustainable method of reducing waste volume and producing energy. In 2015, the BRESCO incinerator emitted roughly double the amount of greenhouse gases per unit of energy produced by each of the 6 largest coal plants in Maryland. Wheelabrator currently receives unearned subsidies for this energy. The BRESCO incinerator is an aging, outdated facility that burns trash from Baltimore City and Baltimore County. Even though the industry touts the facility as “green energy,” BRESCO emits more NOx air pollution per unit of energy than any power plant in Maryland. NOx is the primary pollutant that contributes to the formation of ground-level ozone, or smog, and the Baltimore area has long been classified as the U.S. EPA as failing to meet federal ozone standards. NOx also contributes to the formation of fine particles, a pollutant that has been associated in studies with premature death from heart and lung disease. Baltimore City has substantially higher rates of asthma hospitalizations and emergency room visits due to asthma than the rest of the State of Maryland. In 2016 BRESCO emitted over twice as much NOx as Maryland’s other trash-burning incinerator in Montgomery County. The proposed regulation will reduce BRESCO’s NOx emissions by about 20 percent and also create a pathway for much steeper emissions reductions in the future. 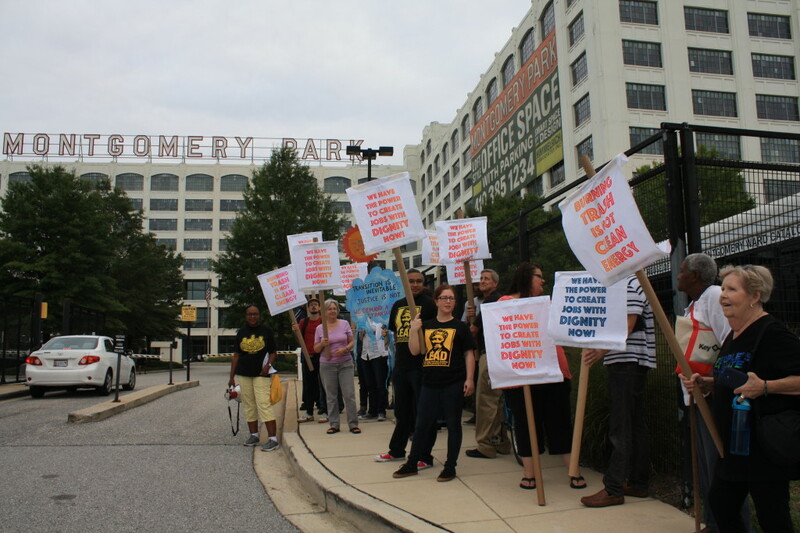 Under MDE’s proposed regulation, the Wheelabrator Baltimore incinerator must meet a NOx limit of 150 ppm on a 24-hour average starting on May 1, 2019 and a NOx limit of 145 ppm on a 30-day average starting on May 1, 2020. MDE projects that these new limits will reduce the incinerator’s NOx emissions by 200 tons per year, meaning that, after the limits go into effect, the Wheelabrator Baltimore incinerator will likely continue to emit around 900 tons per year of NOx. (which is still over twice as much as the 418 tons of NOx emitted in 2016 by the incinerator in Montgomery County). In addition, the proposed regulation requires that Wheelabrator must submit an analysis by January 1, 2020 of achieving additional NOx reductions at the BRESCO incinerator, including the potential to install additional pollution control technology. Wheelabrator Baltimore would also be required to propose new NOx pollution limits to MDE by January 1, 2020 for the Baltimore incinerator based on the results of the feasibility analysis. After Wheelabrator completes the study, MDE says it will write stricter regulations in response to the company’s findings. On September 17, 2018, the Baltimore City Council passed a resolution calling on MDE to require Wheelabrator to conduct a rigorous analysis relating to the installation of new pollution control technology for NOx at the Wheelabrator Baltimore incinerator. The resolution also called upon MDE to begin a second rulemaking process and set much stronger NOx pollution limits upon receipt of the analysis from Wheelabrator. 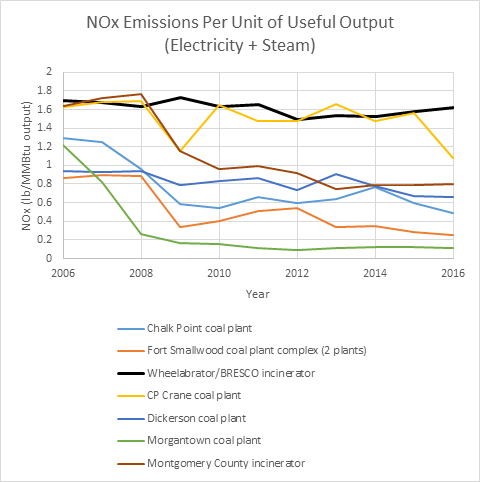 This graph shows the amount of NOx air pollution per unit of electricity and heat (steam) produced by the BRESCO incinerator in Baltimore (black line) compared to Montgomery County’s municipal waste incinerator (brown) and Maryland’s six large coal plants. The data show that the BRESCO plant’s rate of pollution is higher and has remained relatively constant, while pollution from most of the other plants declined over a decade. 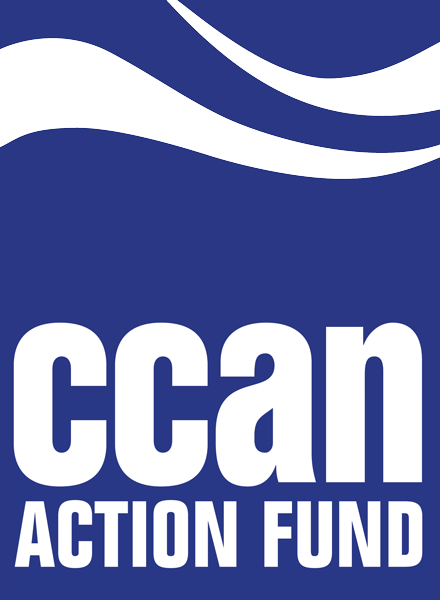 Courtesy of the Environmental Integrity Project.